Best part about breastfeeding? You don't have to bring baby food with you! Worst part about breastfeeding? The girls are out all of the time and some people are highly offended by it. 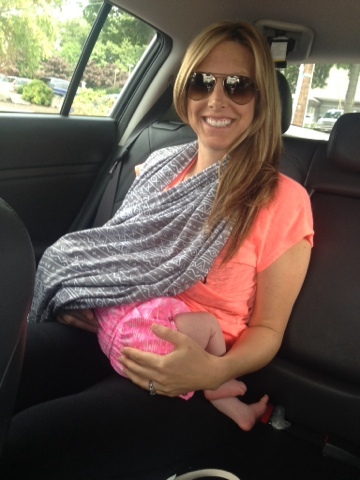 I was recently given the opportunity to review a nursing infinity scarf aka a breastfeeding cover aka a great mini blanket to cover yourself in the car when your husband keeps the AC on 60 and high all of the time. This entire post was written from the car, hence the sunnies and the backseat pics. This is what happens when you are on maternity leave and have nothing else to do and you see an epic looking coffee on Instagram that is made with coffee ice cubes and called "the cubsta" and the closest place to get this "Cubsta" is an hour away. BUT this place also has amazing sammwiches and it totally worth the drive. It's called Brooklyn Water Bagel. We were in the car for a good 3 hours yesterday and my little peanut slept for most of it. She woke up for a quick snack and that's when I fell in love with this nursing cover! See? People can look in your windows and you have full privacy! These are made by Carolyn. You have heard me talk about her before on my blog. She made our nursery crib sheets and changing pad cover. She is a stay at home mom and her husband is a two time veteran and I love working with her. All of her fabrics are from independent designers and they are super soft! Custom orders are a specialty of hers so sometimes the fabric she has will be exclusively for you! She also makes organic wood teethers that we will be using once we get to that stage. I can't say enough good things about the quality of her stuff! Most nursing covers are just nursing covers and that's exactly what they look like. This one looks like an accessory. It is by far one of my favorite baby/momma items lately and I highly recommend all breast feeding fashionista's have one. 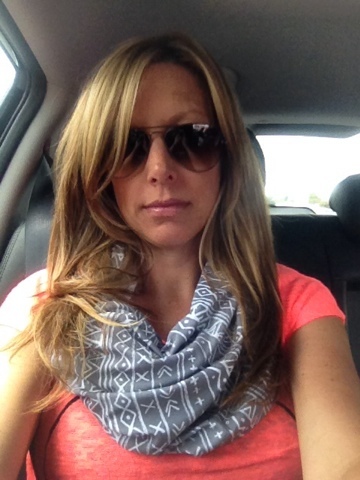 Carolyn is offering 10% off of any nursing scarf with the code JESS upon checkout. This offer is good until August 6th. If your a new mom head on over and grab one or if you know someone that is having a baby, this is a great shower gift! You look far too clean and rested! :) Haha I kid. Hope you guys had a fun little trip. I need to hear more about these coffee and sandwiches! So jealous sweet Charlee sleeps in the car! Think she could teach my little guy how? Love the scarf, I think I need one.